← How Much Love is Your Lawn Giving You? During the July 17-18 storm, numerous trees came down all over Minnesota. 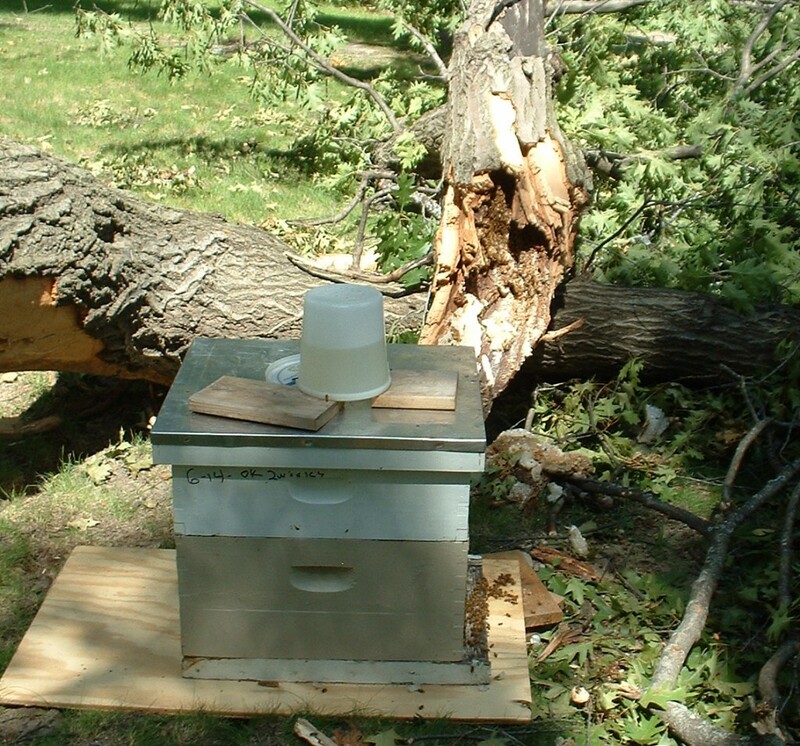 I got a call that a big tree branch was down at the Edenwood Camp, in Eden Prairie, MN, and it had a honey bee hive in it. I didn’t need any more hives, and had no experience recovering bees in the wild. So, I called Minnetonka beekeeper, Grace Sheely, who was interested in trying to recover them. Surveying the situation, we found that the honey comb was entirely exposed. There were still bees on the comb, and a cluster of bees with the queen on a small branch nearby. 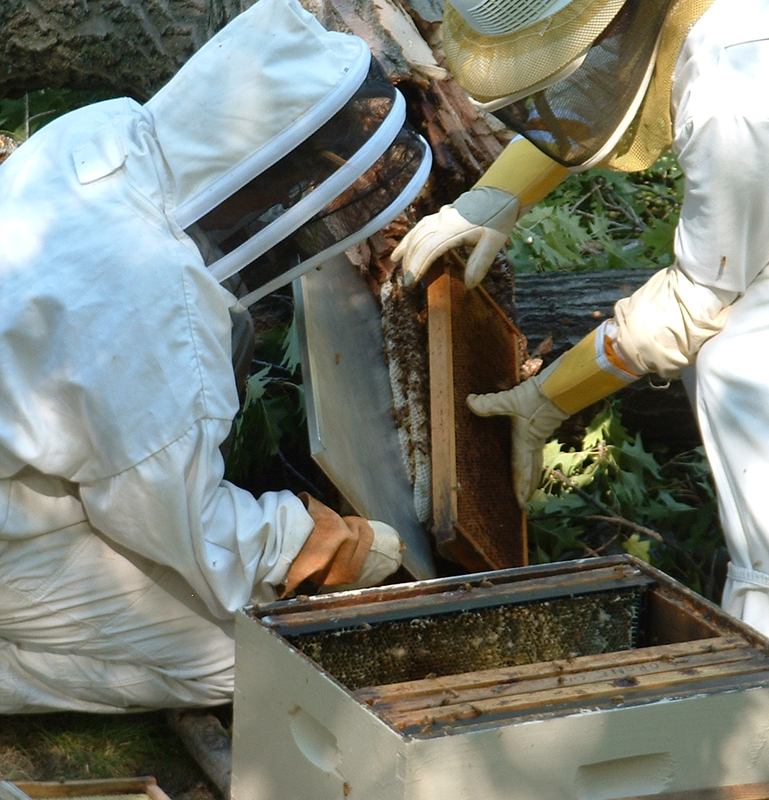 Grace used a cookie sheet to transfer the comb onto the hive frame Dewey was holding. 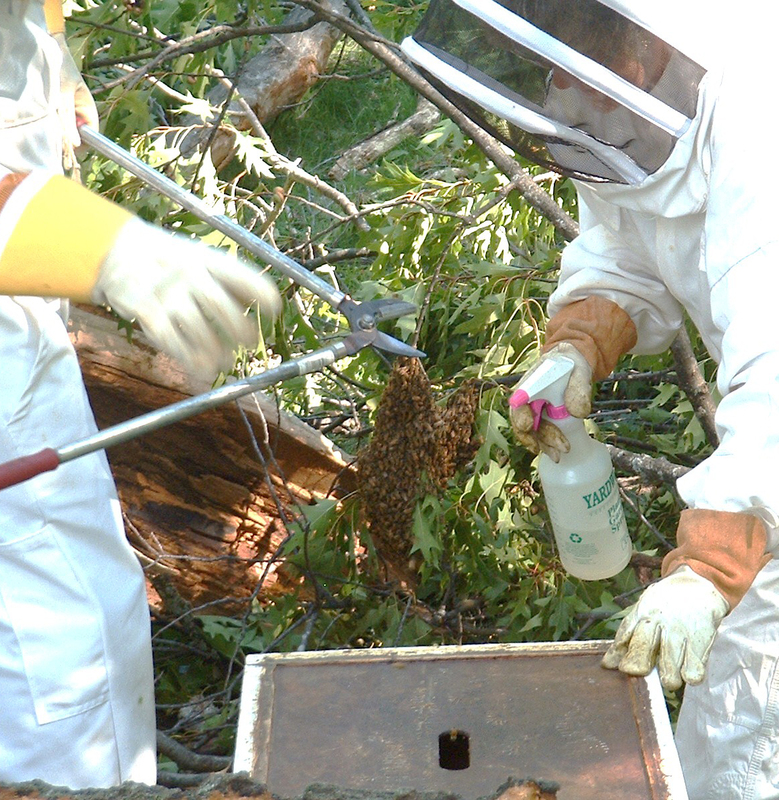 After collecting hive boxes and all the equipment we needed, we began to recover the bees. Considering the trauma the bees had been through, they were far calmer than what I expected, and possibly less excited than my own bees at home. My concern was how we were going to get the comb and bees into the hive box. I had no idea how to do that, and simply followed Grace’s instructions. Setting a half empty hive box on the ground near the tree branch, Grace used a cookie sheet to scoop the bees and fragile comb onto hive frames I was holding. Cutting the branch and moving the queen and the cluster of bees into the empty bee hive. After getting as much comb as we could scoop up into the hive box, it was time to recover the cluster of bees and queen on the nearby branch. We put a second partially empty hive box on top of the first box, to place the cluster in. As Grace held the two small branches the cluster was on, I cut them. She then put the cluster in the hive, and we scooped up a few balls of bees that had fallen off the cluster and put them in the hive. Then we closed up the hive, but left an opening in the front of the hive boxes. Bees going into the hive. The most amazing part to me, was how quickly the bees realized the hive box was their new home. It was less than an hour, before most of the bees that had not been captured were in the hive box. I feared that many of the bees that were initially outside the hive box would be lost. The next day, I saw that the bees were back to business as usual, and I felt like I had saved a life by rescuing that hive. In the wild, the hive would have had to start over, and no chance of making it through the winter. But with the help and care of beekeepers, now, they had a chance of surviving. “I have never seen a tree hive of bees, also never played “Winnie the Pooh”. 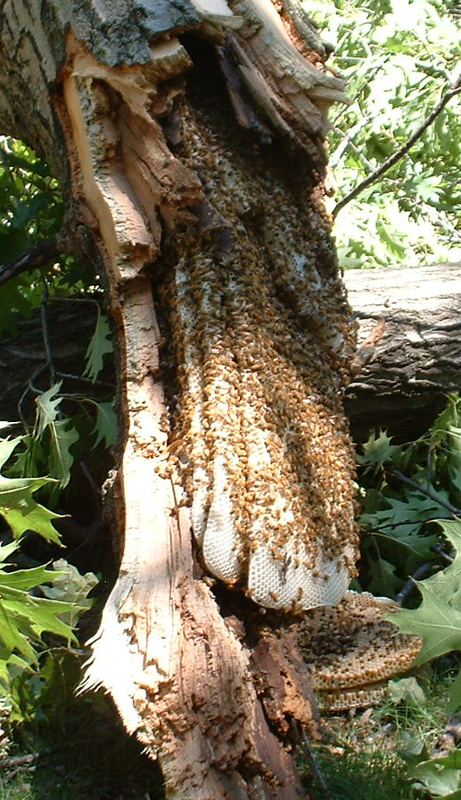 The tree hive was originally more than 30 feet in the air as part of a very large oak tree. The whole oak tree did not fall, just the hollowed out part. I went back a few days later and took more docile bees and honey out with a spatula. These bees were struggling to fight off many raiding insects (wasps and yellow jackets) from taking their honey. I actually saw piles of bees killing small yellow jackets…the larger wasps seemed more difficult for them to manage. 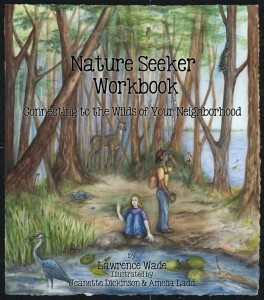 This entry was posted in Connecting to Nature, Insects, Nature Guardians. Bookmark the permalink. What a fantastic story, thanks for sharing. Extraordinary experience just reading the story of the rescue! Thank you very much to both for saving many little lives and helping mother nature to continue the natural rhythm. We do also depend on these tiny creatures so much, that every opportunity to help them is a gift for us! I appreciate hearing about this story, Larry. Thanks to the intervention of Grace and Dewey, this bee colony will most likely survive the impending winter and live on. These bees were a wonderful example of not panicking, trusting and going with the flow for a positive result. Nature provides us with excellent role models.